Whitetail deer definitely go through some tough times in the winter months, and this is the time when you see the survival of the fittest at its best. The weak and the young may not always make it through the winters, especially in the Northern areas where these deer are located, which is one of many whitetail deer facts regarding their life during the winter. While all the deer have a difficult time during the winter, here is a closer look at the whitetail deer buck and how the winter goes for him. 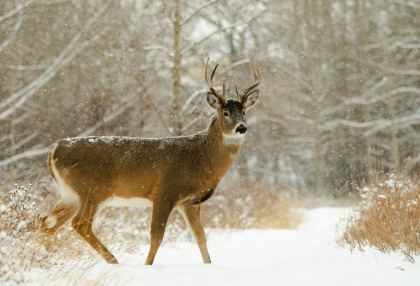 During the winter months, it can be difficult for the buck to even survive, especially with the harsh, cold weather and the scarcity of food during this time. In some cases, deer may end up migrating quite a ways to get away from the worst of the snow and cold that they are dealing with during the winter. The eating habits for the buck change during the winter as well. Food is usually quite scarce for them, and at this time they begin to feed on things that they usually wouldn't. They will actually eat brush, twigs, and if really hungry, they may even begin to eat bark off the trees during the winter months as well. Sometimes the fare can get so scarce that the bucks begin to eat about anything that they can find, and this can be hard on their stomachs. In fact, sometimes a buck can die, still having a stomach that is full of food, but the stomach was not able to digest, still allowing the buck to starve to death during the winter. 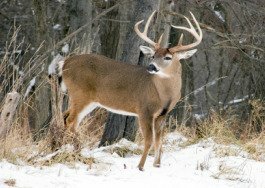 Often the older bucks have a hard time during the winter as well, since they are already worn out after the rut, and many of them die because they don't have the resources physically to endure the entire winter. While there are many problems with finding food and surviving the winter, one thing that is good is that the whitetail deer metabolism usually will slow down during this season, so they don't have to find as much food to stay alive during this time. By the time winter rolls around, whitetail deer bucks have developed a very thick coat for the winter to help keep them nice and warm during the cold months. Since the coat is grayish brown during this time, it helps them to absorb all the heat from the sun. Also, when it is very cold, the buck will tighten up the muscles of his skin, making the hairs stand on end, which helps to trap air near the surface of the skin, helping to insulate the buck and keeping him warm as well. While the harsh conditions are definitely a problem for the whitetail deer, the buck really has more problems with lack of nutrition. In fact, sometimes a buck may go without food for days, which means that all the fat they have stored up during the summer and fall is now being used and very important. So, if whitetail deer bucks end up dying in the winter, most biologists actually believe that it is the lack of nutrition that causes it, not the harsh winter and cold. 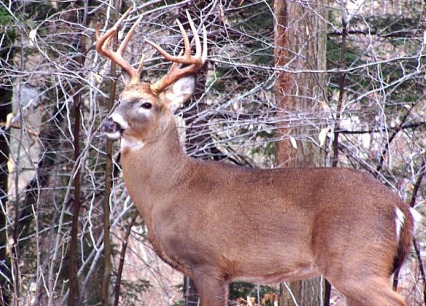 If the Whitetail Deer Buck above makes it to Spring he could be a great trophy next fall. That will depend on his feed and minerals along with his genetics of course.